Question 1: What do you do when your toddler helps to clean up by throwing your money in the trash? Answer: Hug the little helper tight and be thankful there were no poopy diapers in there. Question 2: What do you watch when you want to be entertained without being accosted by unnecessary special effects, dreadful plots and dialog that bores? Answer: “The Scent of Green Papaya.” For me, this 1993 production is one of those rare jewels of a film that seems to engage every aspect of filmmaking at a multi-sensory level. You can see, hear and in some cases you even imagine, or if you are lucky remember what it is like to run your fingers through thousands of grains of rice, to smell the air as it settles into a musty – mid morning moment on a humid day, or to taste the flesh of green papaya. In many ways this film felt like watching a lyric opera in my living room. And I was so relaxed and inspired by it that I didn’t even mind the ending, or the lack of dialog between the two main characters in the second half of the film. In fact, I didn’t even mind watching it again, which is rare. Question 3: What is the best way to spend $5 bucks? Answer: Buy ingredients to make Green Papaya and Golden Beet Juice. 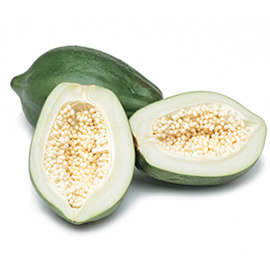 Green Papaya is a powerhouse fruit, offering benefits from Vitamin C and E, anti-cancer properties (particularly prostate cancer), antioxidant properties and carotenes. In addition Green Papaya helps to not only replenish good bacteria in our intestines, but it also helps to destroy bad bacteria which can lead to constipation and other digestive issues. It also has anti-inflammatory properties and according to the George Matejan Foundation “Papayas may be very helpful for the prevention of atherosclerosis and diabetic heart disease.” Studies have also shown that because a ripe papaya loses some of its enzymes when it ripens, to get the greatest benefits, it is better to eat papaya in its green, unripe stage. So try this recipe. If you don’t have a juicer, cut all ingredients into small one inch pieces and put them in your blender with a little water. Place ingredients in a power juicer and juice on high. Use leftover pulp in curries, salads or stews . Also note that the green papaya juice is on the bitter side, depending on where it is in the ripening stage, but don’t be alarmed, that’s why we added the beet and carrots. Together they offer a very smooth and nutrient rich finish. Sorry there are no images I drank it too soon. 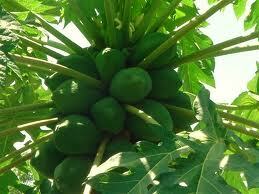 You are currently reading The Scent of Green Papaya and other ramblings… at The Prude Papers.